San Diego is a beautiful city with an amazing climate. You could pretty much surf year-round. In 1542, Juan Rodriquez Cabrillo claimed San Diego for Spain. It later became a part of Mexico in 1821. After the Mexican-American war, in 1848 California became part of the United States. It was not inducted into the union until 1850. Today, the population is estimated to be 1,419,516 as of the 2017 census making it the eight largest city in the United States. That means there are a lot of opportunities for restaurateurs to open their dream business. There is a lot of competition as there are almost four thousand restaurants in the area. Blue Water Seafood Market & Grill is located between San Diego Avenue and Winter Street in Mission Hills. The creation of childhood friends who grew up in the area surfing, fishing, diving and boating. They acquired a taste for fresh seafood. Their trips to Ensenada exposed them to fish tacos where they were invented. While boating, they would catch tuna and consume ahi sashimi in the galley. At the end of the day, they would take the white sea bass they caught and grill it on the beach over a mesquite campfire. Today, they purchase much of their fresh fish from local fisherman. Their goal is to never serve seafood that has been frozen. Many of the online reviews, of which there are almost two thousand, rave about, rant about their fish tacos. As a fish taco lover, this one is on the bucket list. For those of you who want to cook at home or on the beach, you can visit the Blue Water Seafood Market. There they can have them cut you the piece of fresh Yellowtail to make that perfect meal. Phil’s BBQ first opened in 1998. They are located on Sports Arena Boulevard at Hancock Street. 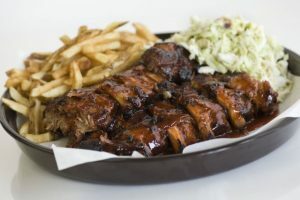 Owner, Phil Pace, likes to brag that his mesquite grilled chicken, beef ribs and baby back ribs pulls in a diverse clientele ranging from boarders to Bentleys. Phil likes to think of himself as a self-made barbecue connoisseur. He did not grow up in the South eating prime barbecue nor did he have a mentor to teach him the skills. He just had a knack for creating amazing barbecue sauces and rubs. He estimates that since Phil’s BBQ first opened their doors, they have served over one million gallons of his top-secret recipe barbecue sauce. Today they have over five restaurants opened in the area all of which carry the same menu. They can brag about the over five thousand posts web reviews giving them four-point-six-star-rating. The Crack Shack is between Ivy Street and Juniper Street in the Little Italy district of San Diego. 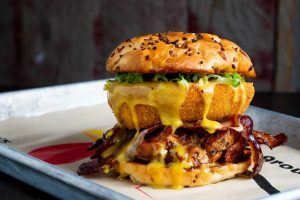 The love of chicken became an obsession for celebrity-chef Richard Blais and CEO Michael Rosen. CEO Michael Rosen insists on using only free roaming chicken in The Crack Shack. He loves to pair chicken with just about anything you could possibly pair it with. Chef Richard Blais got his start in McDonalds preparing their filet-o-fish sandwiches. He went on to win on Top Chef All Stars and guest hosts for many food shows. Dana Pena, Director of Operations, and Jon Sloan, Culinary Director, oversee the everyday operations of The Crack Shack. 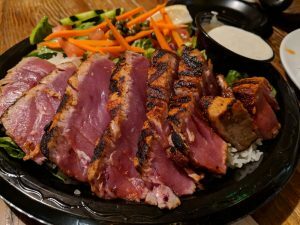 Now with five restaurants in the Southern California area, and one opening soon in Las Vegas, Nevada, they love the over two thousand two hundred reviews they have on the web. This article has been brought to you by San Diego Hood Cleaning Pros. 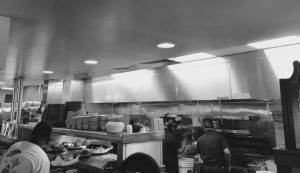 Our team of professionals have been cleaning commercial kitchens for years in the San Diego area. Hood cleaning is an important part of keeping commercial kitchens safe for employees and clientele. Logon today to see our website at https://sdhoodcleaningpros.com to learn more about the importance of proper hood cleaning.